Quagga mussels cover a boat's propeller at Lake Mead, Nev. The invasive freshwater mussel first entered the U.S. through the Great Lakes. 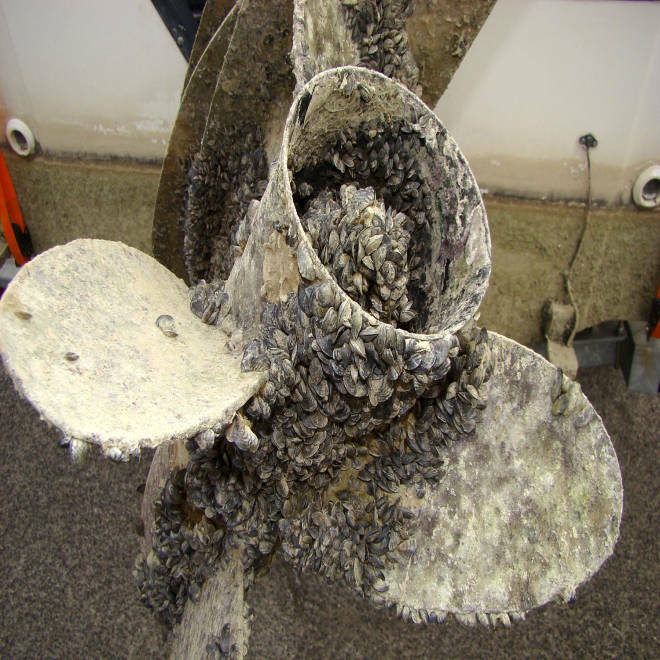 Nonnative species like zebra mussels, which clog pipes and have caused billions of dollars in damage along Great Lakes shores, are the target of the first-ever federal rule on how many living organisms ships can discharge with their ballast water. A decade in the making, the rule is being published Friday, but environmentalists say it doesn't do enough to protect U.S. waters from the invaders. Calling it a "starting point," activists said the Coast Guard rule needs to be strengthened, either by states or the Environmental Protection Agency. A major concern is that the rule gives shipowners until 2019 to implement controls that prevent invasive species from being discharged when a ship releases ballast water. "Getting treatment technology on board ships is a welcome step, but we're disappointed the Coast Guard is manning a slow boat toward a truly protective standard," Joel Brammeier, president of the Alliance for the Great Lakes, said in a statement. "The onus now rests with the EPA and states to shut the door on invasive species to protect our waters, jobs and way of life," added Marc Smith, a program manager with the National Wildlife Federation. The rule sets limits for how many living organisms may be discharged. Those limits, the Coast Guard said in a statement, "are supported by reports from the National Academy of Sciences and the U.S. Environmental Protection Agency Science Advisory Board in 2011 as the most stringent that vessels can practicably implement and that the Coast Guard can enforce at this time."